The quiet, cold days of winter are well and truly behind us, and hayfever season is over (for most)! As the days draw longer and we get more daylight to soak in our surroundings, new species of birds arrive in all their splendour. 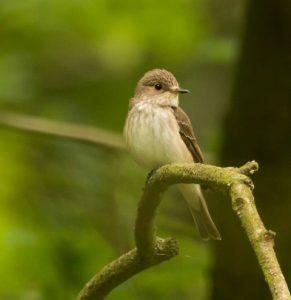 Let’s take a look at some of the species you can see in Norfolk this summer, in our summer birdwatching in Norfolk guide! This insect hunter migrates here from Africa for the Summer, feeding on dragonflies. 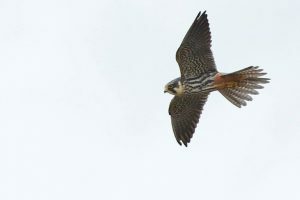 The Hobby is a small member of the falcon family – with a wingspan of just 74-84cm (29-33in), it is smaller than a Kestrel. Keep an eye out for their distinctive first-summer plumage! Look out for: their slate grey bodies and fluorescent red thighs. Dark stripes line their bodies. 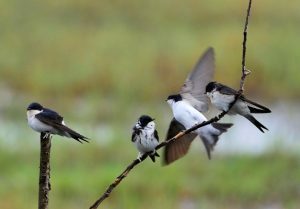 Sadly, the House Martin has seen a rapid decline, and we aren’t sure what is causing it. Nonetheless, they grace us with their presence in our towns and villages during the warmer months, making their nests in the eaves of houses. Look out for: their forked tails and blue/black upper bodies. Their distinctive white rump distinguishes them from Swallows. Spotting these summer visitors can be a challenge as they are largely nocturnal, spending the daytime asleep in camouflaged surroundings. However, their feeding and courting activities start at dusk, giving you a small opportunity to catch them before the light fades. With a wingspan of just under 2 feet, this bird is not so small. Listen out for: the male’s churring song performed from a prominent perch. 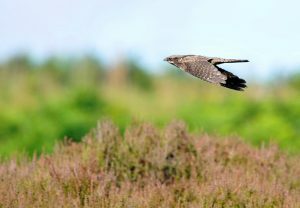 Look out for their recognisable flight pattern of a deep flapping action followed by periods of gliding in irregular, stunted intervals. This beautiful small bird has seen a decline of 79% in its population since the 1960’s, but conservation work is being done on its behalf. Preferring areas with ivy growing on the trees and walls such as cemeteries and parkland, you can find them throughout the summer. Look out for: their streaked crown and breast that gives them their name. About the size of a Robin, but altogether a more pale brown colour. A rare bird with distinctive, large yellow eyes that afford nocturnal foraging. Thankfully, this Amber-listed species has seen a rise in numbers over recent years. As a result, they are easier to find than before, and one of the best places to spot this bird is at NWT Weeting Heath between March and October. Look out for: the bird’s large eyes and long, yellow legs. Also, listen out for its distinctive wailing call, which sounds a bit like ‘cur-lew-eek’, giving it its common name. Swift by name and by nature, these are the fastest birds in level flight – clocking in at 69mph! In addition, they almost never land – they even sleep and mate in mid-air. 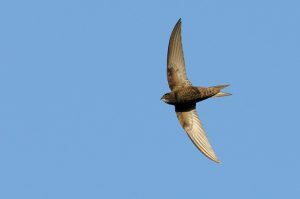 Also, some Swifts have been found as high as 10,000 feet! They return to the UK in April and May to breed, and can be found along the coast, as well as in urban areas. Look out for: their forked tail and blade-like wings. With a wingspan of about 16 inches, these birds aren’t tiny, but they aren’t too big either. 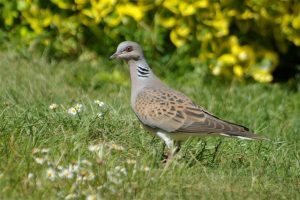 Named after the soft purring sound of its song, the Turtle Dove is a distinctive bird that arrives in late April to breed. 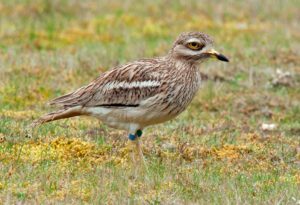 Unfortunately, this bird is on the Red list, meaning that is it vulnerable. Furthermore, it is protected in Britain. Look out for: its unmistakable cobblestone-like pattern of brown and dark patches on its wings, as well as the white and black bars on its neck. That about does it for our guide to summer birdwatching in Norfolk! We hope you spend this summer looking out for all these birds and more. 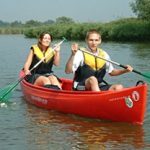 More information about them can be found on the Norfolk Wildlife Trust website.